Unlike many vintage stoves that seem to all look similar, The Chambers “stands alone”. There is nothing that comes close to it’s design, durability and unique cooking features. Let’s start off with a bit of history – Around 1910, John Chambers came up with the very bright idea of combining the technology used in the fireless cookers of the time with the increasingly popular gas stoves. Chambers first called his new invention the Chambers Fireless Gas Cooking Range we now know it’s slogan as The Range That “cooks with the gas turned off”. In 1912, The Chambers Corporation began to manufacture ranges for the national market in Shelbyville, Indiana. 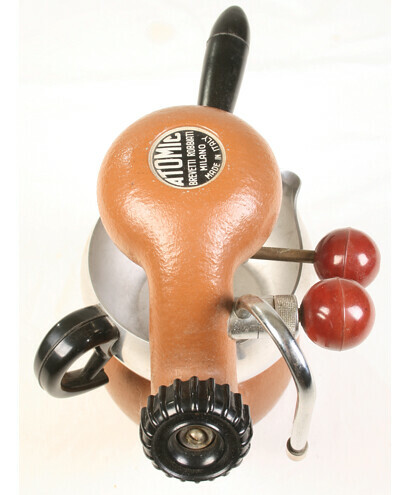 Interesting fact from www.chamberstove.net – The CHAMBERS Corporation did not spend a lot of effort (or money) in advertising nationally.Their efforts were directed more on a local level – through the cooking schools and demonstrations, merchant/dealer “give-away’s”, and local newspapers. In the next few posts, we’ll look at all the Chambers features and models. I especially want to thank Todd at www.chamberstoves.net for his great site with everything you ever need to know about The CHAMBERS and www.vintagechambers.com for his pdf files!! The Atomic In Action – Oh my! Watch this machine in action. Love it! It’s a sleek, modern mid-century icon that has the classic style we all treasure – it’s the Atomic. On sorrentina’s website, www.sorrentinacoffee.com he gives us a great history on the Atomic here’s a tidbit – “Mid–twentieth–century Milan designer Giordano Robbiati achieved a spiritual union between form and function when he devised a new type of coffee maker in the late 1940’s”. Different designs, different colors make some of these rare collectibles. If you find a vintage Atomic you better grab it up! 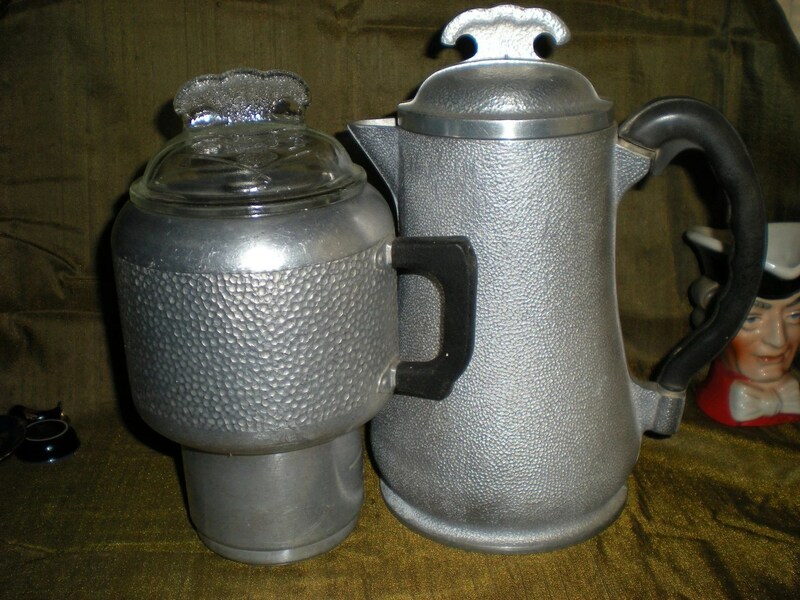 We all know ebay is a great source to find a great vintage percolator. But have your tried etsy Yes, they sell vintage along with their beautiful arts and crafts. etsy has a great selection of funky percolators from the 40’s through the 70’s. From a 20 cup harvest gold West Bend to a Kar-N-Home portable model you can find them all on this great site. I think the prices are great and the selection is fantastic. You have to read about John Poole’s mother’s coffee pot in his blog, Hawkins House. It’s old, it’s dented and seen better days and I’m looking for one just like it! In his blog post he explains how the percolator works – “For those who are unfamiliar with this simple, but effective, piece of technology, there is a strainer sitting on top of a hollow tube. The tube has a flare at the bottom. Ground coffee is placed in the strainer, and the strainer-tube assembly is lowered into the percolator, which is filled with fresh water. You put the lid on and then place it over a flame on your stove top, and as the water begins to boil, it “perks” up through the tube, is caught by the little glass plug on top, is deflected back down into the strainer, flows through the coffee grinds, and then drains back into the percolator’s main body. Tomorrow we’ll look at Funky Vintage Percolators. I never knew they were so popular and there were so many. Mind boggling. 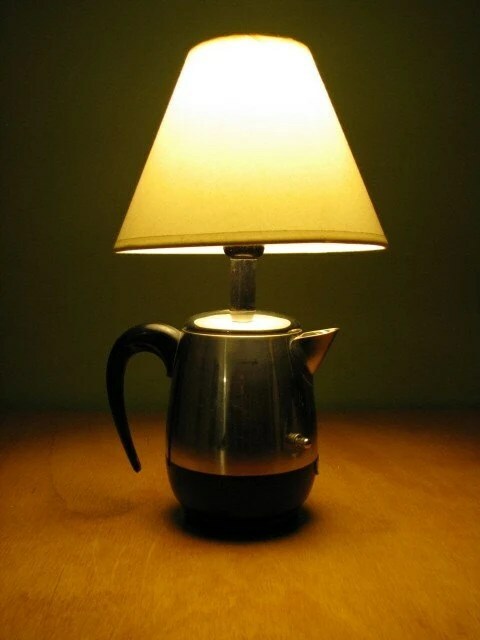 Upcycled Vintage Percolator Lamp by AwesomeZone4000 on Etsy. I can’t function in the morning without coffee. I get up early – before 5:00. It’s dark, it’s quiet, no one is up but me. I make my way straight to the coffee maker then on to the internet. I write, I look and drink some more coffee. I’m awake, I’m alive and I’m ready to move on to my life. So you don’t drink coffee? Well great for you! 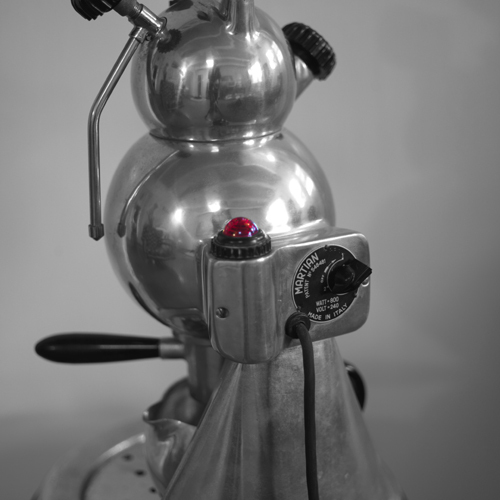 This week, I’ll do some posts on Vintage Coffee Makers. Funky ones, mid-century ones, the percolator and hopefully, interview Kevin Gillespie (a serious coffee maker collector). I’m planning a full feature about the artist who made that Awesome Vintage Upscaled Peculator Lamp, Ben Mills. If you love the pic of the Upscale percolator Lamp – check out the other lamps by Ben in his etsy store, .AwesomeZone4000 on etsy. Here’s the link – AwesomeZone4000 on Etsy. Ben can also be reached at awesome4000@gmail.com.